Continuing the trend, WordPress has released yet another update on 8th of June, 2017. The new update was named after famous american jazz pianist ” William John “Bill” Evans ” and has many new updates to help developers as well as non technical persons. Lets talk a bit about the latest wordpress update that’s been released only a day back. What’s New In Latest WordPress Update? WordPress 4.8 came with lot of possibilities and updates and as quoted by WordPress ” it adds more ways for you to express yourself and represent your brand”. The new features, that have been added in the latest wordpress update are link improvements, three new media widgets covering images, audio, and video, an updated text widget that supports visual editing, and an upgraded news section in your dashboard which brings in nearby and upcoming WordPress events. It was really tough for a normal human being(those have zero technical knowledge) to add images to the sidebar of blogs or to the website’s footer and for that you need to customize your theme code to add an extra space for the image. Sometimes, fitting an image at some place unnecessarily forces your code to break apart which results in an unstructured website. So, to sort that problem out, WordPress has rolled out an image widget that can help you insert your image right within the widget settings. Wow! I always wanted it so easy. Welcome your user’s with an amazing infographical video that may contain some statistical information of your products or services. It’s the best way to humanize the branding of your website. Just like video widget and image widget, audio widget is also newly introduced to the latest wordpress update. It simplifies the issue of adding an audio directly to your website without even writing or editing a single piece of code. To add audio to your website, simply drag and drop audio widget from your widgets section to the active widgets area and upload the music file to the widget. It’s that simple. Just few clicks and your audio is ready to shower music on your users. What Else Is New In The Latest WordPress Update? It happened with me a lot, whenever I try updating a link or some text around it, it mixes up. Sometimes, adding new text after the link ends up being a part of the link itself. Another scenario, where you try edit the text of the link, but the text ends up outside of it. I know this is really frustrating as I have gone through it a lot of times. But now, thanks to Link Boundaries, links will remain in their boundaries and will not try to gel up with the new content every now and then. 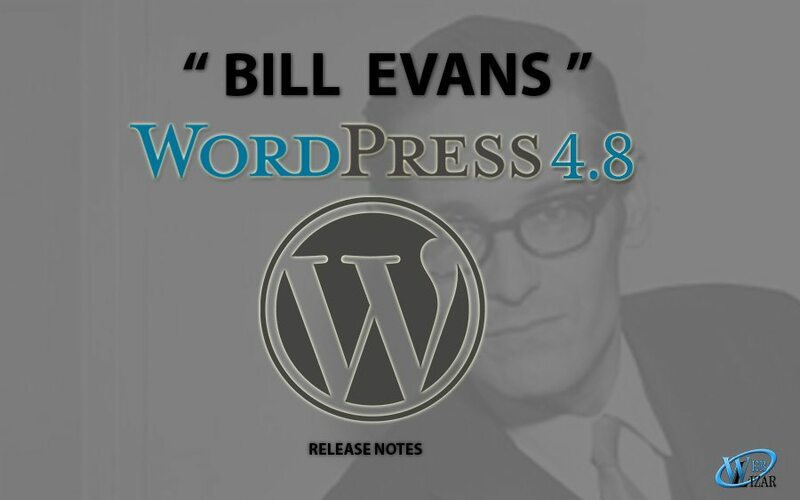 There’s so much new in the latest WordPress update “Bill Evans” and the released version is WordPress 4.8. For more information, you can visit WordPress Blog. Also, to read more of our blogs, do visit our blogs section.